Paleobotanists have identified an extremely early aquatic flowering plant montsechia vidalii in its fossilized form. 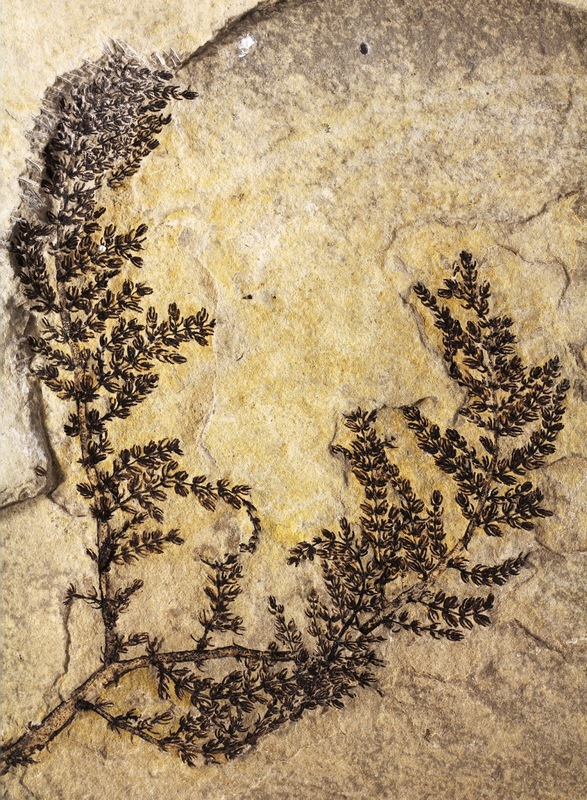 The 125 to 130 million-year-old fossil provides a record of one of earliest known flowering plants on Earth ― a mythical first flower present during the age of dinosaurs. "A 'first flower' is technically a myth, like the 'first human,'"
Montsechia has the rudimentary characteristics of a flowering plant, also known as an angiosperm. "Montsechia possesses no obvious ‘flower parts,’ such as petals or nectar-producing structures for attracting insects, and lived out its entire life cycle under water. The fruit contains a single seed which is borne upside down." Montsechia produced seeds within a carpal, the female reproductive organ of a flower. Carpals are a component of the gynoecium which is the term that describes the parts of a flowing plant that develop into the fruit and seeds. Gynoecium is a composite word from the Greek words gyne, meaning woman, and oikous, meaning house. "There’s still much to be discovered about how a few early species of seed-bearing plants eventually gave rise to the enormous, and beautiful, variety of flowers that now populate nearly every environment on Earth." Fossilised remains of world’s oldest flower discovered in Spain, Helen Thomson, The Guardian, 17 August 2015. IU paleobotanist identifies what could be the mythical 'first flower', Indiana University Bloomington Newsroom, 17 August 2015. Montsechia vidalii: Paleontologists Identify One of Earliest Flowering Plants, Sci-News.com, 18 August 2015. Mythical First Flower Found, Jennifer Viegas, Discovery News, 17 August 2015.